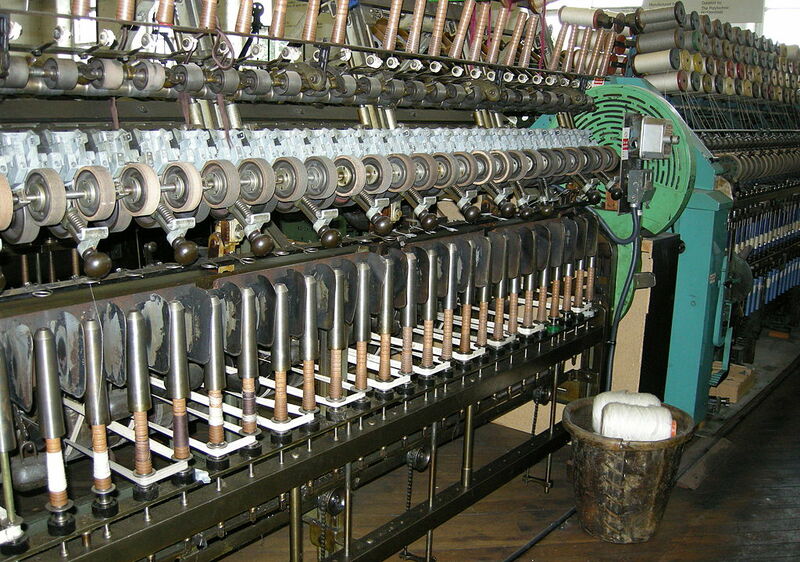 The commonly used, time-tested spinning technique, ring spinning is one of oldest machine oriented spinning techniques used for staple fiber spinning. The staple fiber such as cotton and wool has to go through a series of processes until reaching the finished product or the yarn package. The drafting arrangements are inclined at an angle of 45 degrees to 60 degrees. The draft is the ration between the delivery speed and the feeding speed. (10), which are located underneath the drafting system. The metal ring is the origin of the name of the ring spinning machine. The twist creates friction between the fibers by which the strength of the fiber mass increases. In this state, the fiber mass is now called yarn. The yarn is wound on to a bobbin attached to the spindle. The speed of the spindles amounts to 10,000 to 14,000 r/min for wool and about 18,000 to 25,000 r/min for cotton. Thus one meter of yarn contains between 300 and 2,000 twists. The weighting arm is required to allow different loads to be set on the top rollers. Normally this is achieved by helical springs which can be adjusted mechanically in steps. Also, the distances between the rollers have to be adjustable. The distance has to be larger than the length of the longest fibers to avoid the situation where single fibers are torn between the clamping points of top rollers and bottom cylinders.